I have finished my Oakshott cushion, and it's Friday, so I'm linking up to TGIFF hosted today by Kristy at Quiet Play. If you're visiting from there, hello, and thank you very much for looking in! This cushion cover is my first attempt at piecing curves and I love the way it turned out. It's a present for my lovely mum (and dad! ), to go in their newly decorated sitting room. They live near the sea and the cushion was inspired by that, and also by the curves of the hills in mum's favourite picture of the downs where she lived when she was young. It is backed in a piece of Lotta Jansdotter Little Florine, and I managed to work out how to put in a concealed zip not too shabbily. I can't wait to try curved piecing again - it was fun to do and not nearly as difficult as you might think. I'm quite (pathetically) proud of these flat seams. To make matching edges, lay two pieces of fabric down both right side up with their edges overlapping, and cut through both with your rotary cutter. I didn't pin (I can never be bothered, which probably explains a lot), but held the two pieces loosely, right side together, one in each hand, lining up the edges only at the point just ahead of the foot. If you use each hand to guide the edges gently towards each other as you bring them in line with the side of the foot, they come together surprisingly easily. The most important thing is not to tug because it stretches the fabric and causes puckers. Don't forget to look at the lovely things on show at Quiet Play today. it's beautiful, and you have every right to be proud!! Yes it's absolutely beautiful and one of my favourite colour palettes although I have my eye on those ruby reds too as I want to make a Marrakech quilt! Your mum and dad will love it! Looks gorgeous. I absolutely love the improv curves - you've done a wonderful job! fantastic! 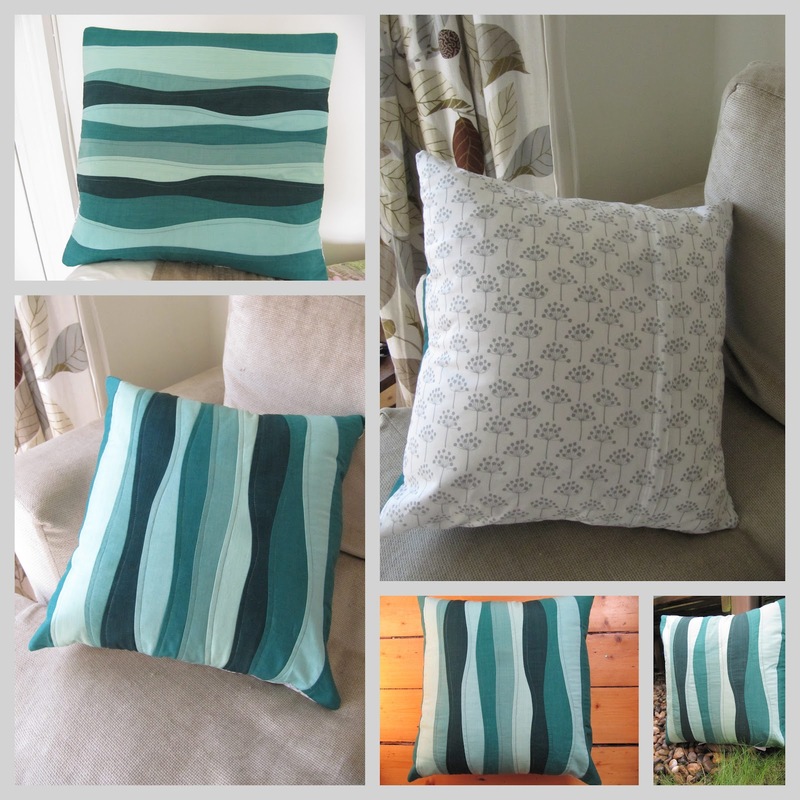 I love the colours, they are perfect for a beach side home ! I love those seams they look so perfect and flat! Beautiful! It's so beachy, I'm sure your parents will love it! What a beautiful cushion, those curves are just perfect! Oh my gosh! I LOVE it! I love the colors and the curves. Fabulous job! Beautiful! I love those colours and the feeling of flow. Great job! Thanks for linking up to TGIFF! Lovely cushion, those curves really echo the motion of the sea. That is just beautiful! Thank you for the tips. I've never done anything curvy because it just seems like it would be difficult. You may have given me the courage to try! Absolutely beautiful! Gorgeous colours and well done on the fabulous curved piecing! That's something I haven't really tried. Oh, I love that cushion. Oakshott cottons are just fabulous, aren't they? And the curves are very well done. You have every right to be proud. What a very nice gift for your parents. What a good daughter you are!